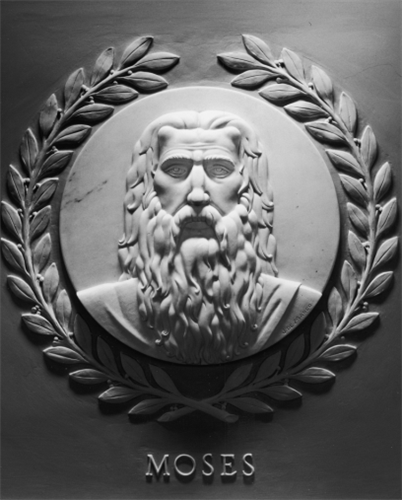 Israeli Prime Minister Benjamin Netanyahu is addressing a joint meeting of Congress at 11 a.m. ET on Tuesday to lobby for tougher sanctions against Iran. As you watch the speech, follow along here for live updates. 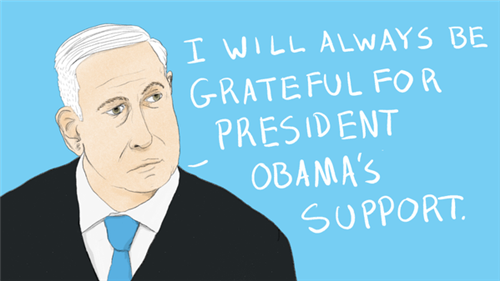 With Vice President Biden absent, there are only Republicans behind Netanyahu in the TV screen. But some Democrats lined the aisle to shake his hand as he entered the chamber. Netanyahu opens by saying it was "never my intention" for the speech to come across as political. As he says "stand with Israel," there is wild applause and it appears the entire chamber stands. 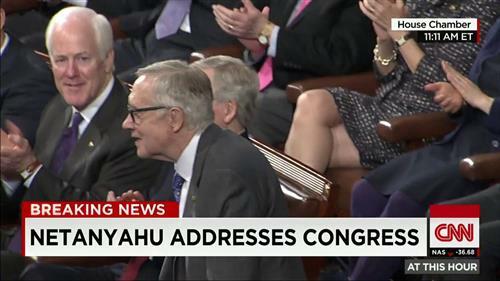 Reid gives a shout out to Harry Reid: "You can't keep a good man down"
Netanyahu: "I will always be grateful to President Obama for that support"
Netanyahu acknowledges he's aware of and "will always be grateful" for Obama's support, after their already tense relationship took a serious hit from the controversy surrounding this speech. 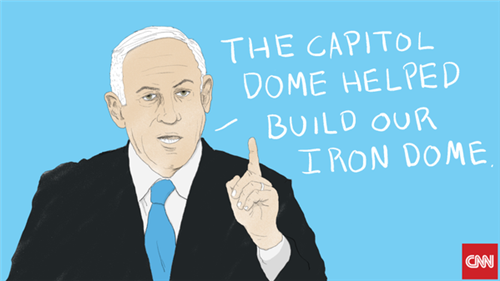 "This capitol dome help build our iron dome," #NetanyahuSpeech "Thank you, America. Thank you for everything you've done for us." a monarch or ruler, especially an autocratic one. "diplomatic missions to foreign potentates"
Iran's ayatollah "spews the oldest hatred, the oldest hatred of anti-semitism, with the newest technologies," Netanyahu says. "He tweets that Israel must be annihilated." 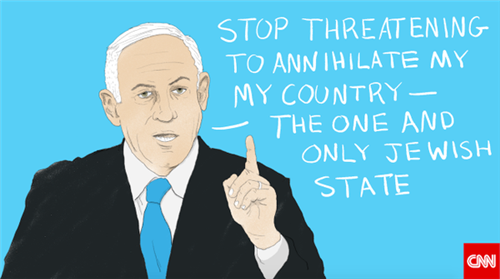 Netanyahu warns Iran's constitution "pledges death, tyranny and the pursuit of jihad." "And as states are collapsing across the Middle East, Iran is charging into the void to do just that." Seems Netanyahu is trying to convince Congress that a nuclear Iran is as much a threat to the U.S. as is is to Israel — maybe more so. "We must all stand together to stop Iran's march of conquest, subjugation and terror," he says. Netanyahu draws comparisons between Iran & ISIS: "Iran and ISIS are competing for the crown of militant Isla." Prosecutors said Arbabsiar tried to recruit a Mexican drug cartel to bomb a Washington restaurant where Saudi Ambassador Adel Al-Jubeir dined. But the scheme unraveled when Arbabsiar's cartel contact turned out to be an undercover agent. Netanyahu: "When it comes to Iran and ISIS, the enemy of your enemy is your enemy"
But Netanyahu argues Iran poses a greater threat: Where ISIS "is armed with butcher knives...and YoutTube....Iran could soon be armed with intercontinental missiles and a nuclear bomb." 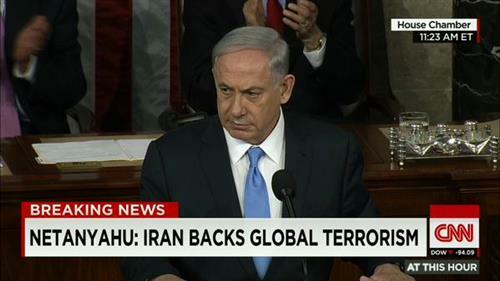 Netanyahu in speech to Congress compares ISIS to Iran: "They just disagree over who will be the ruler of that empire." Netanyahu: While ISIS is armed with butcher knives and YouTube...Iran could be armed with a nuclear weapon..."
Netanyahu warns: "Inspectors document violations, they don’t stop them." Draws comparison w/NK. "Hide and cheat" - One thing for Netanyahu - he's got a way with one-liners. He just accused Iran of playing "hide and cheat" with weapons inspectors. Netanyahu says 10yr timeframe for deal is "the blink of an eye in the life of a nation, the blink of an eye in the life of our children." 10 years - "blink of an eye" - Netanyahu says it is not good enough that under a nuclear deal Iran might be able to pursue the bomb in a decade. While that seems like a long time to a person, "It's the blink of an eye in the life of a nation," he says. Read what President Obama said about the ten year requirement HERE. @DanaBashCNN - have you ever seen a dignitary go down the aisle like they were a sitting president before? And "If Iran’s ICB is not part of the deal...could have the means to deliver that nuclear arsenal to the far-reaching corners of the Earth." The case against the Iranian regime is strong, and the case against concessions is strong, but: What's the plan? Netanyahu: "This deal won’t be a farewell to arms. It will be a farewell to arms control." Netanyahu argues there's no reason to believe Iran will change. "Why should Iran’s radical regime change for the better when it can enjoy the best of both worlds — aggression abroad, prosperity at home?" Netanyahu claims Iran could be "weeks away" from having nukes. Netanyahu's 3 requirements for Iran - Biggest applause line so far when Netanyahu tells Iran to stop being an aggressor against other Middle Eastern countries, stop supporting terror and to stop threatening the existence of Israel, "the one Jewish state." 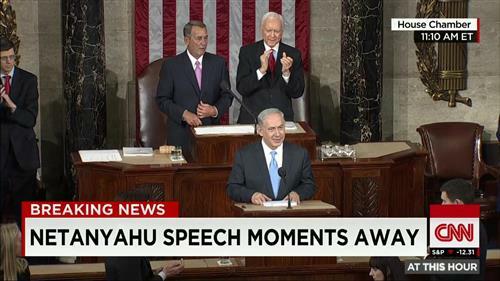 Eager for Bibi to make the turn and share his plan for preventing Iran from getting a nuclear weapon. What's Plan B? 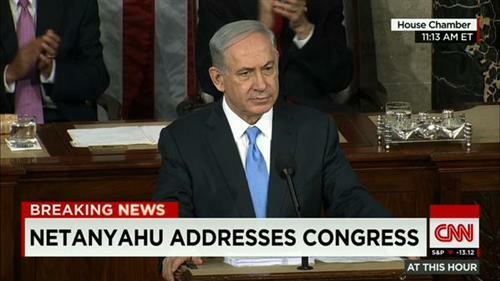 Netanyahu gets standing ovation for that last demand, that Iran stop threatening the existence of Israel. If Iran walks away from a deal, Netanyahu says, "call their bluff. They’ll be back. Because they need the deal a lot more than you do." Netanyahu tells Congress the Iran deal pursued by the White House "is a bad deal." "You're better off without it." The alternative, he said, isn't war, but "a much better deal." 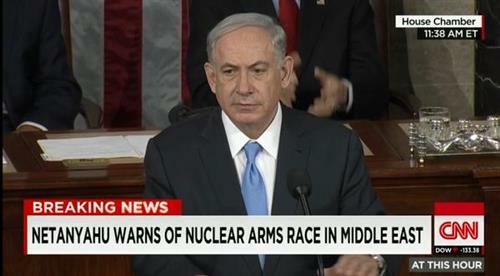 Netanyahu as audience gets raucus: "This is a bad deal. A very bad deal. We're better off without it." After Robert Frost quote, Netanyahu pivots to Elie Wiesel, who is in the audience. Netanyahu calls on US to "call" Iran's "bluff" -- if they walk away from tougher deal, "this often happens in a Persian bazaar"
. @IsraeliPM: I can guarantee you this, the days when the Jewish people remain passive in the face of genocidal enemies--those days are over. "I know that you stand with Israel" Netanyahu says to audience. Netanyahu wraps with "God bless the State of Israel and may God bless the United States of America." stands as the greatest political achievement of the 20th century, and the United States will always have an unshakable commitment to Israel’s security. throughout the Prime Minister’s speech – saddened by the insult to the intelligence of the United States as part of the P5 +1 nations, and saddened by the condescension toward our knowledge of the threat posed by Iran and our broader commitment to preventing nuclear proliferation. A large number of Congressional Black Caucus members boycotted the speech out of solidarity with President Obama, but Rep. G.K. Butterfield (D-N.C.), chairman of the CBC, reaffirmed their support for Israel today. "Israel has many friends in the Congresisonal Black Caucus, and do not think that Speaker Boehner’s move will interfere with our support," he said. Butterfield said, though, that "because I believe it was a politically-motivated invitation," he decided to watch the speech on television rather than attend.